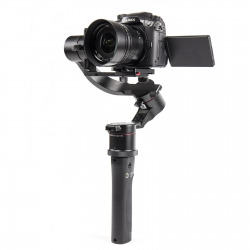 The Pilotfly H2-45R introduces a whole new way of video shooting with highest versatility, flexibility and power efficiency. Its extrodinary and revolutionary design, the 32bit technology with Triple-MCUs and Encoder technology offers you a more powerful shooting experience than ever before. The 3 axes of the gimbal consist of a CNC aluminum alloy construction and is tool-less designed to balance your camera even faster. The powerfull brushless motors were designed with integrated MCUs. 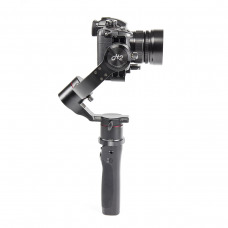 The Roll axis has been shifted 45 degrees downwards to get a direct view to the dispaly which no other gimbal offer you. This makes the Pilotfly H2-45R the most elegant and ergonomic one-hand-gimbal on the market. And we don't want compromises anymore! Therefore we designed the motors without limitation on YAW and Roll. Consequently, you can turn it 360° without having to worry about damaging the cables. Motion time-lapse over all three axis is possible as well now! The Pilotfly H2-45R is breakthrough on one-hand-gimbal development and it is the most advanced gimbal we have ever created.